Having to swallow regular prenatal vitamins has been making my nausea worse, so, after consulting with my doctor, I have officially switched over to chewable vitamins. 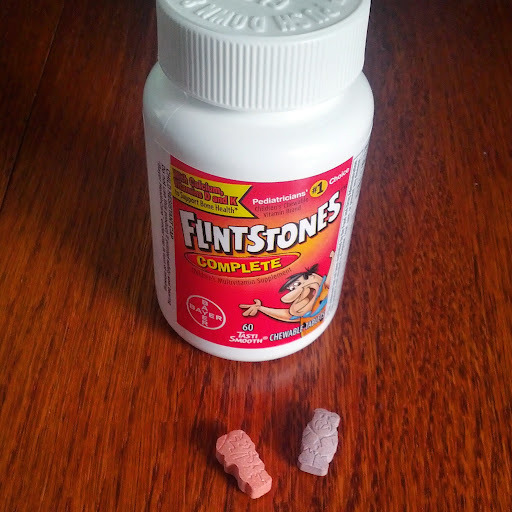 At first, I felt a little silly taking children's vitamins, but the change has made such a difference and now I don't dread having to take them every day. The only drawback is having to remember to take one in the morning and one in the evening... A task that is little more difficult than I imagined it would be. Especially on the days I'm plagued with severe pregnancy brain. If I'm lucky, I actually remember to take the second vitamin with dinner rather than an hour after I've eaten. Speaking of dinner... Since it's Sunday, it's time to share our Menu Plan! Are you ready to see what's on deck for dinner for us this week? Stephen and I usually have pizza on Friday nights, but we wound up having friends over for dinner instead. Since I had already taken the dough out of the freezer, I have to use it or lose it. I'm actually looking forward to having pizza earlier in the week -- a nice change! So... what's on your Menu Plan this week? Let me know in the comments below!